May 12, 2010  This week on Culturetopia: Annette Benning on secrets her characters carry; Lisa Kudrow's new online-only comedy; Chely Wright comes out; the return of Tracey Thorne; and more. May 5, 2010  In this week's Culturetopia: a book about sharing your name, a record label that's off the beaten path, and a fresh approach from a best-selling novelist. April 21, 2010  In this week's podcast of some of NPR's best arts and culture stories, we hear from Michael J. Fox and David Byrne, and look at the contributions of two artists who changed the landscapes of photography and film editing. April 19, 2010  A distribution model is coming into its own. The window between theatrical and DVD releases is getting smaller, mostly thanks to the industry's new interest in streaming and on-demand. NPR's Neda Ulaby looks at the push behind on-demand, and the deals made between services like Netflix and film studios. April 16, 2010  Paul Rhymer has stuffed everything from giant squids to baby shrews. But museums don't need these skills anymore. After 25 years doing taxidermy in the place his father and grandfather also worked, Rhymer recently retired, and the Smithsonian has no plans to replace him. April 14, 2010  In this week's Culturetopia: We've got conversations with novelists, Treme coverage, a book about Oprah Winfrey, and a tribute to Malcom McLaren. You have to admit: we've covered a lot of territory. 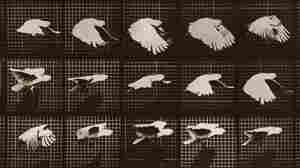 April 13, 2010  A new exhibition at the Corcoran Gallery of Art in Washington, D.C., looks at the legacy of Eadweard Muybridge, whose sequential photographs of horses at a gallop -- their movements broken down frame by frame -- have become iconic.